Music | Delmarie Hines: My Journey. My Story. I must ask you to stick with me on this one. It’s a bit of a winding road. Music has always played a major role in my life and the life of my family. My memories of my childhood are full of music. Lately, I have been enjoying vivid memories of the songs my parents sang to me as lullabies. I am the youngest of 4 children. My older siblings were all involved in music. Someone was always learning a song, a solo, an audition piece, practicing for band rehearsal, choir rehearsal, ensemble rehearsal, piano lessons, or just jamming some 8-track, 45, LP, or tape. Mom was preparing music for Sunday morning worship. Dad was singing some hymn that was in his heart. I was just singing, singing, singing. I loved singing more than talking and that’s saying a lot because I LOVED to talk. I had a terrible stutter as a child. I had to attend speech therapy sessions in elementary school. I had to learn to slow my mind down so that my mouth could catch up. Singing is what my therapist and parents used to help me learn to slow my thoughts down. Stuttering never got in the way of singing. I could close my eyes, see the beautiful colors and patterns and just siiiiiiiinnnnnnnggggg my little heart out. Another trick was that my father would put his hand on my chest and tell me to breathe and then we’d sing together. Dad had a great big tenor voice. I learned to remember that feeling when I would get frustrated or stuck on a word. To this day, putting my hand on my chest forces me to breathe deeply. Dad would often have me read something to him, slowly. He had me convinced that I was reading slowly because he needed to hear it slowly. My mother would gently put one hand on my forehead and her other on my back. That would make me stop, breathe, think and try again. Mom’s trick was to have me read something from her medical journals. That forced me to slow down because I had to sound out all of those complicated medical words. Now I just put my hand on my forehead when I need to stop, breathe, think and try again. My brother, David, would hold me and sing to me or read to me when I got angry or upset. Music and reading were my safe places. My family made them so. My sister, Charmaine, who was my arch enemy in childhood, was also one of my favorite singers. My brother, Milton, my other childhood enemy, could sing like Stevie Wonder and I loved it. I tried not to let it show but I think they both knew that I LOVED to hear them sing. My mother made everything she sang sound sweet. She was THE alto….one of those people simply born to sing alto! Hearing her sing in the kitchen was one of my joys in life. Even way back then, we connected through music in ways that needed no words. People would come to our house to practice their parts and solos with my mother during her years of directing the Sanctuary Choir and serving as the Minister of Music at church. Seeing my mother’s beautiful smile when they sang correctly was everyone’s goal (that arched eyebrow when the part wasn’t right was to be avoided at all costs). One thing she knew for sure. I was going to know my part and be able to tell her who was in my section and not singing correctly. As the youngest child, being a snitch was sort of an art form for me. LOL. My mother and I did a lot of talking. There was a lot to learn. She taught me how to cook…and especially how to cook for Dad. She taught me how to assist Dad and her in their careers and the work they did in partnership. She taught me how to be a lady and a woman. She taught me how to read, write, and edit with an eye for detail and thirst for depth. She taught me how to be a woman in a leadership role especially when I was the only woman and/or the only person of color in the room. She taught me about the power of words and the need to tread lightly at times…never as a sign of weakness but as a sign of strength, wisdom, maturity and submission to God. Here we are at 2017 and my mother is slipping away from me and I’m grasping at straws to hold on to her. The woman whose counsel I depended on heavily can no longer have a meaningful conversation with me. The woman whose dry wit could make me laugh hard is now difficult for me to understand. I find myself approaching conversations with her as I did with my nieces, nephews, and godchildren when they were little. My mother’s facial expressions let me know that in her mind she makes perfect sense, so I do my best to figure it out. She still makes me laugh. At times she gives me that look that lets me know that she no more understands what she is saying than I do. She also has her moments of clarity when she’ll hit me with one of her witty zingers. I give her the side-eye and we both giggle. My mother, a brilliant, deeply spiritual, witty woman with a vocabulary that often sent me running to the Oxford Dictionary (some of the words could not be found in Webster’s dictionary) is slipping away. That ferocious insatiable beast called Alzheimer’s is annihilating her beautiful mind. We are now 5 years into her diagnosis and the years are taking their toll. Since words are difficult for us, we share music…often. We especially share music in the still of the wee hours, when sleep escapes both of us and she calls out for her mother. We hum, listen to music, connect in ways that do not require either of us to try to understand the other. We simply share our love of the vibrations and power of music. I want to keep the music playing. I want to keep connecting. I need to keep the music playing. As a child I learned to turn to music when words were difficult for me to utter. Now I turn to music as an adult as words are becoming difficult for my mother to utter. Music…it’s been there for me my whole life and I pray that the music never ends. This song is about two lovers but with the change of just a few words, it’s applicable to my relationship with my mother. This may seem weird to some, but it’s perfect for Mom and me. Each time you hear her name? 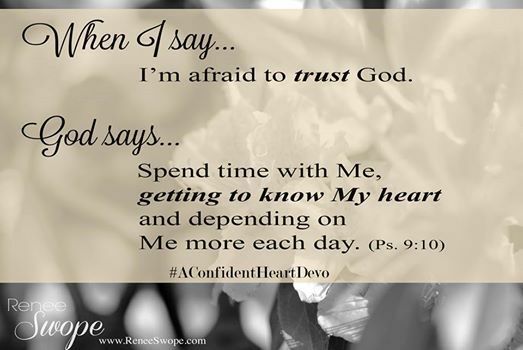 Are you brave enough to confess that you are afraid to trust God? Are you beat down enough to admit that you are afraid to trust God? Are you afraid to trust God? I confess that I have been, I am, and I am hoping to stop this cycle. Trust has been a major issue for me overall. As I’ve stated before, my trust issues went into overdrive when my father died suddenly. I clung to the belief for YEARS that God had made an error and was simply too embarrassed to admit it. I can kinda laugh about that whole way of thinking now but there is still a part of me that is open to accept God’s apology for ruining my life! LOL I let that pain fester and grow into a deep lack of trust for anything that made no sense to me, that could not be documented, or that materialized outside of what I found logical even if not my taste. All along though I still acknowledged God, loved God, and kinda sorta served God (insert side-eye here). There is no way to fully serve God without trusting God. There is actually no way to be engaged in a healthy loving relationship with ANYONE without trust. Trusting God requires passion and commitment. I’m not just trusting God to hold my hand as I cross the street. I’m trusting God to BE THE PATH. I’m trusting God to reveal my future and guide me as I do what God says do. I’m trusting God to be my everything. The trick though is that I have to give up all of my notions of who and how I should be. THAT’S MAJOR! This must be why God sent His Son, Jesus, to be our example. This trusting God thing takes sacrifice and not just giving up Ben and Jerry’s for Lent. It requires giving up your life so that you can live. It requires seeing God in everyone. It requires knowing the will and Word of God. It requires embracing a love that is not always cuddly, but a love that disciplines, that corrects, that cuts to the bone, that sheds blood, that comes with HIGH accountability. That kind of love demands and breeds passion and commitment. Now that I think about it, the question is not just will I TRUST God, it’s also do I LOVE God. Do I love God enough to TRULY surrender all of me to all of Him? It’s been a while since I’ve blogged. There are many reasons for that but we can discuss those later. Today I just wanna talk and hopefully hear back from you. This whole exploration of trust started here. There is a note in my mother’s medical file that states: “Failure to thrive”…3 little words…just 3 little words. Her doctor mentioned the possibility of cancer being the reason she is failing to thrive. If I didn’t have a tight budget I would have SMASHED my phone to make her and her words disappear. PLEASE NOTE: To those of you reading this who know my mother this is not a confirmed diagnosis. At this point it’s just an exploration of what is causing her “failure to thrive.” The tears came quickly…tears of anger, confusion and fear all at the same time. Have you ever been there? It’s a painful place to be. It’s a lonely place to be. It’s also an easy place to get off track in every way possible. This question quickly came to mind, “Who and what will I trust?” I am a Christian so that question more specifically for me is will I trust God to be God? THAT IS A HUGE QUESTION!!! I knew that I needed to run to God but it was more like confront God. I was angry. I wanted to let God know a thing or two about the way my journey is playing out. My prayer time was not focused on miraculous healing for my mother. I have laid her at the altar before God and I am caring for her to the best of my abilities. There is nothing more that I can do than that. God is a healer and that remains true no matter what. I heard or read this recently, “Everyone who God heals also eventually dies!” With that in mind, I was ready to let God have it. Unexpectedly though, my prayer time was not focused on my anger or my list of grievances against God. My prayer time was focused on trust. The question I wrestled and am wrestling with is will I trust God no matter what? This is not some undefined trust. I’m talking about a trust that shows up as an unconditional yes to whatever God asks of me. A trust that shows up as unconditional and full surrender to God over what I want. A trust that shows up as obedience to God. A trust that shows up as complete, irrevocable, absolute submission to God. I am clear that I’m using words that many like to steer clear of these days. I’m in my 50’s now. My need for popularity and to be one of the cool kids ended a LONG time ago! I want an intimate and powerful relationship with God…a relationship that gives God glory. I want to be a disciple of God. Those goals require trusting God. Anyone who knows me knows that I am a fan of embracing reality. Today’s challenge was to embrace the reality that God’s will can be and at times will be painful for me. This pain is in direct correlation to my desire to have what I want, the way want it, when I want it. God’s will is my joy only if I die daily and in Him alone live, breathe and have my being. We get to heavy blowing, running, shouting, dancing, speaking in tongues and whatnot when we declare that. The truth of the strength and courage of this conviction though is revealed when life smacks you in the face with a brick or your own choices lead you to run at full speed into a brick wall. Well I’ve been smacked and I got angry with God. That anger surprised me. I went all the way back to things that happened in high school and went down the list of the times I felt that God had disappointed me, forgotten me, abandoned me. When I stepped into the Prayer Room today the anger left and I was left to struggle with trusting God. I cried…and I’m still crying. I recited scripture. I talked with God. I heard from God. I listened to music. I sang. I cried some more. The thing that I am most clear about is that my mother will be fine. The work I have to focus on is me and my relationship with God. It’s not over. I’m still processing. What gets you through your battles in life? How do you let go of anger? How do you turn life’s circumstances into opportunities to grow closer to God? Do you trust God to be God? What does that question mean to you? Let’s pray for each other as we navigate through this thing called life. Let’s talk about trust.